Download a scanned copy of Javed Chaudhry’s book “Zero Point II (Collections of Urdu Columns)“. We are thankful to our friend Umar who has shared this great resource for all of us. 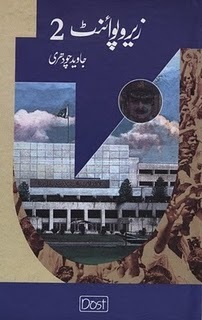 soon, we will update books section http://www.dailyurdunews.com/javedchaudhry/books to make available other books too. You may subscribe your email at www.dailyurdunews.com/javedchaudhry to get an update when resource will be available. you have excellent writing skill(which is no doubt ALLAH’s gifted)…. kya mein sare adition download kar skta hn??? @Hafiz. sure no doubt that these extra qualities are God gifted but Mr. Choudary worked very hard. Please just go n read his article “Chewgum“. after that you will be able to say that every success no doubt is granted by almighty ALLAH but not possible without tearing the hear. THANKS SEARCHED EVERY WHERE BEFORE! AND JUST LET US ALL KNOW IF THE OTHER BOOKS “UNDER PROCESS”? I MEAN WILL OTHER BOOKS WILL BE AVAILABLE FOR DOWNLOADING? The creative writting should be used to expose the evils of the society but in your all TV shows it looks to me that your invitees have no decent norms, no content in their talks and they are wasting time. i see your excellent try about this Mr. Jawed Ch has God Gifted skill,s My All Dua,s with u and ur favorite Writer. JazakALLAH for sharing 3 books…plz upload all books…and in which book you will write the remaining part of zeropoint 4’s meri dastan thori thori?? ?I’m waiting to know what your baba told you??? sir, i cant describe u in words.i would only say that your wourds have greatly influenced my life. Javed Uncle apne naam ki tarah hamesha zinda javed rahein. aur yun hi taleem o tarbiat ka silsla jari rakhen. you are a well writer sir.i like you and i prayer thah god bless u.
you’ve a good quality of writing and a soft heart for pakistan . but i want to ask a question if u dont mind,”you give us a lot of awareness about current affairs as well as some solution of problems of our country. but no one apply this solution. hat is the ultimate solution to make this country in peace. zra num ho to ye mati bri zarkhaiz hy SAQI,,,,,,,parr matti num krny ka zimma hm sb ka hy ,,, ap apny faraiz ba-khoobi nibha rahay hain,,Allah hamay b toufeeq dy!!!!! Mr.Javed Chaudhry is the columnist of this time, who speaks from the heart of the people and he has a vast view. Asslamualikum.. javed chaudhry i see kal tak regularly.you are a good and pious man.i hope our president would have an effect of your columns.Excellent Javed Chaudary.I also read your books. YOU ARE MY FVRT WRITER.OUTSTANDING SKILLS YOU HAVE. plz convey my comments to admiral chief navy on his briefing in which he told there was no security lap. javed uncle you are great. Javed Chaudhary is not more than a miracle for the new world. He has been remained my inspiration till I have come to conjuncture the world. I am pleased to read and retrieve knowledge from his worthy consecutive books. Which was made possible by your efforts. Thanks…. sir your thinking is so nice and it will bring a change……. !